When I started writing this post it was 1 day, 14 hours, 57 minutes, 33 seconds until Star Wars. 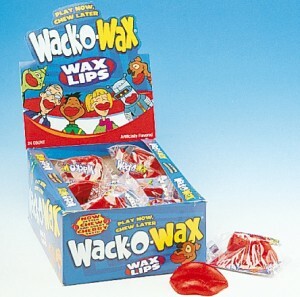 On the nose — Red wax cherry lips, grape soda (even getting a sting in the nose like you would if you were to sniff a fizzy soda pop), fruity soaps (focus on the fruity and less on the soap), lipstick. Hints of stone fruits but they’re all a bit too overripe/overly sweet. Normally I like perfumey, floral whisky but I’m not sure about this one. Time to taste. In the mouth –Heavy malt character, decent mouthfeel, all followed with notes of cherry chews, lipstick (again), grandma’s perfume, a little cedar wood, more grape soda. A little jalapeño jam on white bread. Finish — Long and floral. In sum — I’ve not met a BenRiach I haven’t loved until now. This one was not up my alley, I have to say. 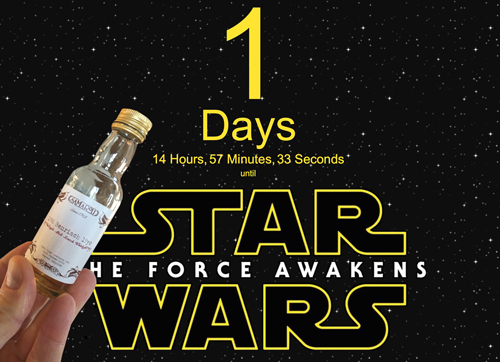 I hope that this whisky does not reflect what my experience of Star Wars Episode VII will be. Tutilltown Distillery sits quite nicely in the woody woods in beautiful upstate New York. Tuthilltown, makers of “Hudson Real American Whiskeys”, is a small place with a dirt driveway and parking lot, port-o-potty bathroom sitting outside the tasting room (quite far away mind you) and has two cats and a dog wandering the property. Don’t let this description scare you away – pulling up, you sort of feel like your at a home away from home. There’s an inviting feel to it somehow. 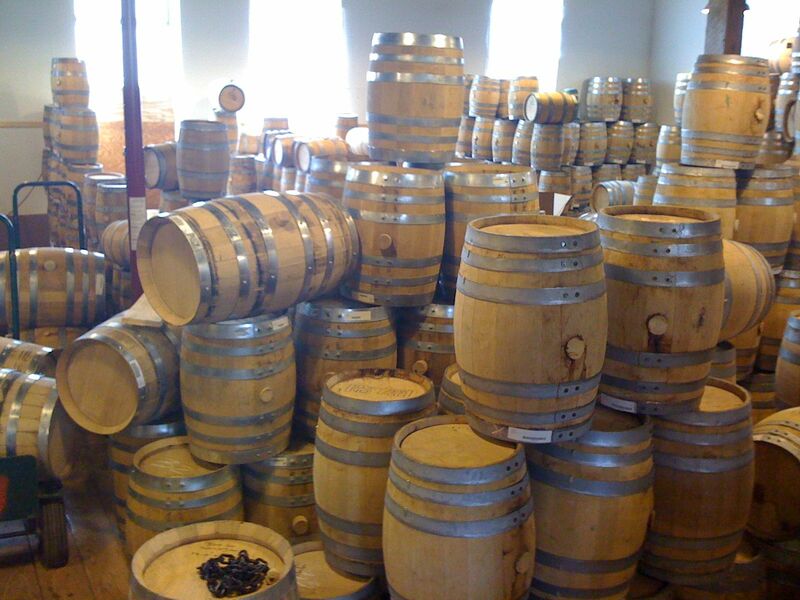 After getting-a-lo to all of these beautiful barrels (most of which were quite small, some at only 3 gallons!) I met with a very nice woman by the name of Luz. She’s in charge of the store and provided some great conversation as I waited for the tour guide to arrive. When the guide was ready, Luz walked me over to the actual distilling building where I then met with a tall hipster-type dude by the name of Liam. Before I go on, I will tell you that this is the first distillery tour I have ever been on and I did not know what to expect. I can tell you, throughout the whole experienced I was a wide eyed boy in a candy store! Actually, it felt more like I was Charlie visiting Wonka’s Chocolate Factory (sans the Oompa-Loopmas, Gene Wilder and Slugworth). Liam took me through the entire distilling process, room through room (which is nearly the same for their bourbons, rye, single malt & vodkas). I will not go into tremendous detail here but I will say what surprised me the most was how very hands-on the whole process is. Liam (and the other distillers) have their fancy-fingers on everything and you can tell that it is a true labor of love for them and, as you’ll see in my tasting notes below, this love and care shines through to the end product. I was quite wowed by their two stills (at least one of which was imported from Germany and was originally used for making Lambic beers). All four bottles are placed, by hand, onto the dipping posts (I totally made up that term, dipping posts – Tuthilltown folks, feel free to used that nomenclature for this dipping apparatus) then dipped, again by hand, into the wax. The bottles are then labeled (you guessed, by hand – using a hand-cranked labeler). Liam – thank you for your tour! Very informative, very cool. I met with a guy, I’m guessing about my age, by the name of Gable. His father is one of the fine, smart, folks who opened this distillery. 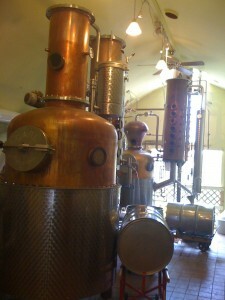 Which, by the way, is the first legally operated distillery in New York State since Prohibition!! Also, their bourbon is the first bourbon to *ever* be produced legally in New York State. 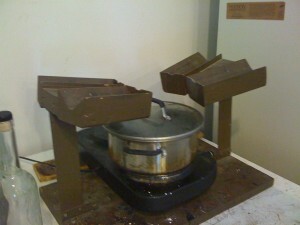 Like I said, smart folks – very innovative! Gable is one of these super-charming and disarming type guys. A charismatic dude who knows his business quite well. Gable went on to provide a tasting of their current line (at least the ones they could legally taste/sell in their tasting room/store): Hudson New York Corn Whiskey, Hudson Baby Bourbon, Hudson Four Grain Bourbon, Hudson Manhattan Rye, Heart of the Hudson Apple Vodka (twice distilled), Spirit of the Hudson Apple Vodka (thrice distilled). Their Vodkas, by the way, are Kosher for Passover as they are distilled from apples, not grain — Cheers on that!! While I wont be giving notes on all the spirits tasted, I can provide notes for the two bourbons I went home with (what, you thought I could leave empty handed?? I had to buy me some booze!). 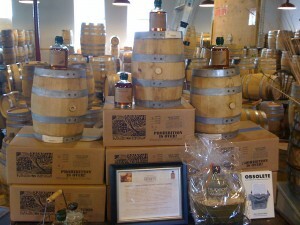 Before I go on with the notes allow me to say that these whiskeys only come in 375ml bottles and cost $41 per bottle. This being said, the fluid contained within the bottles are worth their weight in whiskey! 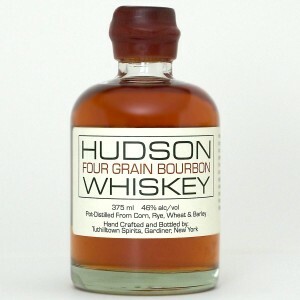 This is hand-crafted artisan American Whiskey. Quite unique and very special stuff. 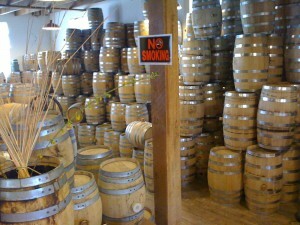 On the nose — One thing I truly love about the Tuthilltown/Hudson Whiskeys is that the smells and tastes are very direct. When I say I smell “Corn”, it’s like it’s fresh off the cob. Just under the corn is the very clear smell of fresh dirt/earth (as if someone was holding a handful directly under my nose). I’m also smelling burnt sugar and honeysuckle, blueberry (very subtle, the only subtle smell here) and vanilla. Gobs of vanilla. On the mouth — Oh sweet fancy Moses! 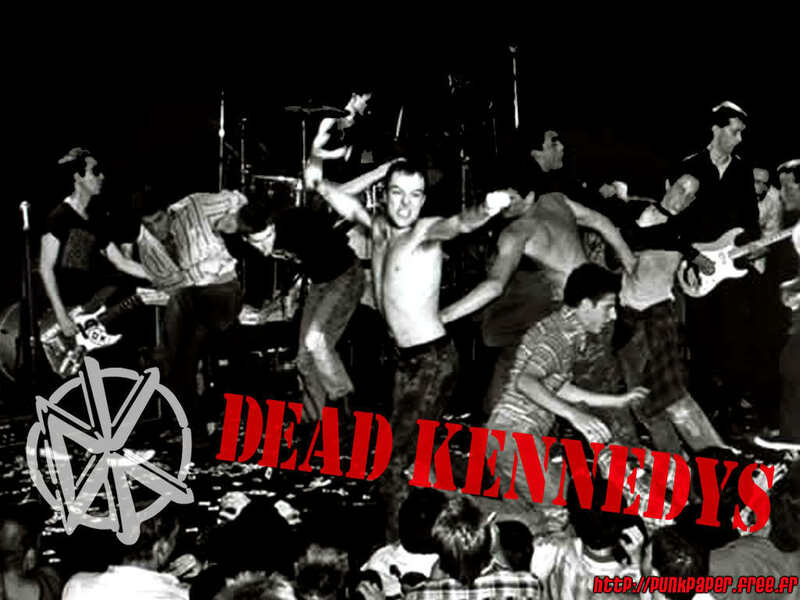 The flavors basically started a mosh-pit in my mouth (it’s like there’s a Dead Kennedys show, circa 1984, right on my tongue). The attack is great, fierce yet quite welcome. This is a strong, burly bourbon which is filled with a mouth puckering sweetness a la sweet corn, cinnamon, Orange Tang Powder, the taste of the smell of clove cigarettes, oak and quite some vanilla again. Finish — Long, peppery and biting. I want more (why do these only come in 375ml bottles!?). More corn. Candied corn (NOT Candy-Corn if you catch my meaning) actually; that and some nice citrus, then finally more fresh dirt/earth. On the nose — Movie popcorn with butter, vanilla & burnt sugar (again), no fresh earth smell here, rather, it’s replaced by a slightly soap citrus notes, Red Wax Lips. On the mouth — Fresh & warmed buttered corn on the cob. Again, Tuthilltown delivers with their very direct flavors – yum! I feel like I am on a picnic right now. Banana peel & vanilla cream, the citrus returns. Finish — During my tasting with Gable I noticed an odd note in the palate of their Manhattan Rye expression. 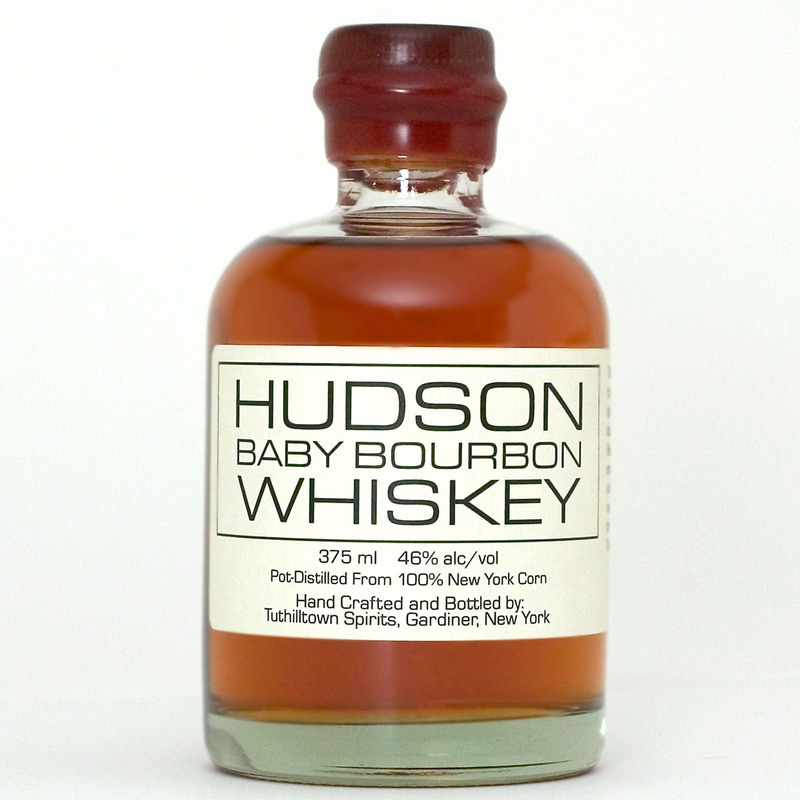 A note that I detected in the finish of this Baby Bourbon – Jujubes! 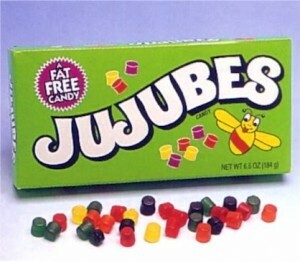 Specifically the orange ones before Heide Candies changed their recipe (back in the late 90’s early 2000’s) – quite soapy and very orangey. Love it!! That’s the final note on the finish. Before I got that I noted some warming caramel, vanilla and oak. In sum — This was a great introduction to the whole process. While I spent the last three years educating myself in the tasting of whisk(e)y, I just now got a nice crash-course in the whisk(e)y creation process. One I will never forget. If I were you, I would seek out Tuthilltown’s Hudson Whiskeys. A true American Treat. 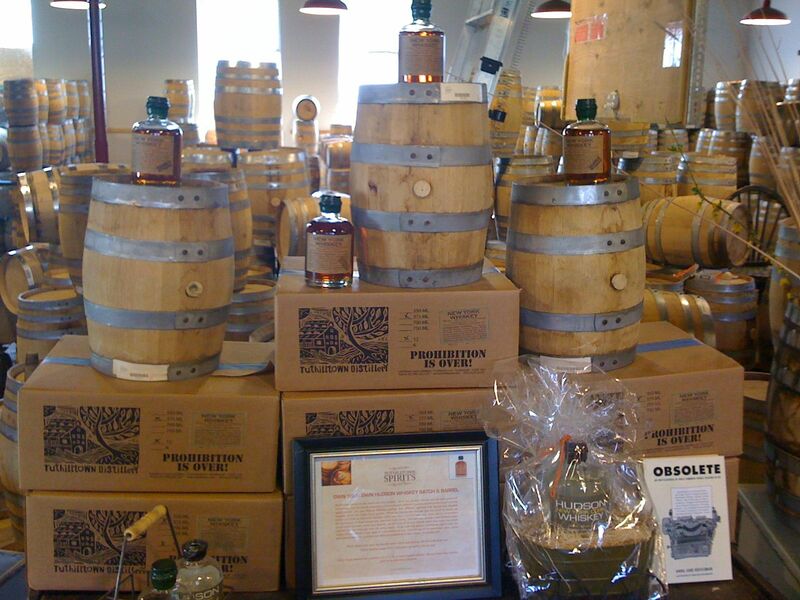 If you ever find yourself in New York State, seek this distillery out . They provide tours on weekends and their store is open from 11am – 5pm. 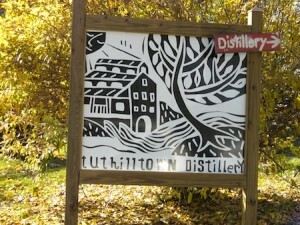 For more information on Tuthilltown and their whiskeys, check it here.